8 CDs. 9:47 hrs. Listening Library. Nov. 2017. $60. ISBN 9780525532484. digital download. Gr 9 Up—Guilt is a powerful motivator. Add uncertainty and grief and you've created an almost irresistible force. This is what Jessa Whitworth faces when the mother of her missing and presumed deceased ex-boyfriend coerces her into cleaning out his attic bedroom. She and Caleb broke up several months ago, but he came to her at her last cross country meet, and when her favorite necklace broke, she hurried from the starting line and asked him to hold it while she ran. He left before she finished, and all anyone knows is that parts of his car have washed up below a broken guardrail on a bridge over a river leading to the sea. Feeling lost, Jessa quit running and hanging with friends and felt almost ghostlike at school. When Caleb's mom contacts her, she has mixed feelings. She resents the demand, but she needs closure. But the more time she spends in his room, the more questions she has. She's also feeling a wary attraction to Max, Caleb's best friend, who wants closure, too. As they uncover more information, however, they realize how little they know about what really happened to Caleb. 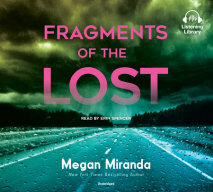 Narrator Erin Spencer does a stellar job of pulling listeners in and letting readers imagine nearly every moment. VERDICT A good addition to any library.